Employers across Ireland are being urged to sign up for Ireland’s fourth National Workplace Wellbeing Day on Friday, April 13th 2018 an event which aims to improve employee well-being through promoting better exercise and nutrition in the workplace. The corporate world has in recent years seen the benefits of GIY in the workplace, and its potential to reduce the stress and improve the mental and physical health of their employees. 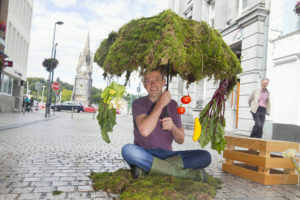 Some of the best places to work in Ireland are using workplace vegetable gardens to create a productive and happy work environment. GIY@Work companies carry out an al-desko growing programme, install their very own GIY garden or get connected and volunteer at a local community food-growing project. Michael Kelly has put together his top 5 tips for improving your workplace for this year’s National Workplace Wellbeing Day. Studies are suggesting that employees who don’t talk about topics other than work and eat at their desks may have poorer mental health than those who do. Supporting healthy eating is fantastic, but encouraging employees to take their lunch breaks and eat together is even better. Research shows that certain plants act as air purifiers and also release oxygen into the atmosphere. This significantly improves indoor air quality and employee cognition. Good plants for indoors spaces include kale, mint, coriander, jade, bamboo and snake plants. Like plants, humans need regular exposure to UV light to encourage production of Vitamin D and elevate levels of serotonin in the body. This makes us feel happier and more content. Allowing for a few minutes of outside time during the day can dramatically increase employee wellbeing, particularly if there’s some nature involved (trees, plants, grass). Growing food is a mindful, hopeful, purposeful activity that reconnects you with food and health and can even be done your desk (we call it al-desko growing). Some of our partner companies have put in veg gardens where employees can do some food growing on their breaks – getting your hands in the soil is known to boost serotonin levels and gives employees access to delicious, seasonal, organic food. One guaranteed way to increase productivity in your office is to create a sense of purpose and belonging. Encouraging employees to contribute to something meaningful in the community, like a community garden, through paid staff leave, in or outside of normal working hours, is a fantastic way to develop organisational pride and improve employee morale. Yes, a free fruit bowl is a great way to encourage healthier snacking in the workplace. It is also a healthy way to get through the morning and afternoon tea time sugar lows. But research also shows that seasonal food is food at its most nutritious and delicious. So, think about what’s in the fruit bowl and whether it is in season. 1) GIY helped to develop a food garden at the iconic St James’ Gate Brewery in Dublin with Diageo for employees to start growing food. The company sees the garden as a way to improve the health of employees while enhancing team building, collaboration and decision-making. Diageo has won the ‘Best Large Workplace to Work’ as a result of their commitment to employee wellbeing. 2) As part of a multi-year partnership with Symantec, GIY supports staff to grow food in a specially constructed veg garden outside the staff restaurant. Last year the Symantec GIYers sowed herbs, salads, garlic, broad beans, onions and potatoes. Michael Kelly founded the social enterprise GIY in 2008. Having grown his own fruits and vegetables for several years, Michael discovered there was no local food growers group in Waterford, so he set one up himself. GIY inspires and supports people to grow their own food at home, in school, in workplaces and in the community. During 2018 GIY will support over 850,000 people and 8,000 community food-growing groups and projects in Ireland and the UK. The ethos behind GIY is that when people grow food on any level they gain an understanding for food called ‘food empathy’, which has a significant impact on their well-being and the health of the planet. In October 2016 GIY opened the award-winning GROW HQ, the home of the GIY movement and its National Food Education Centre in Waterford City. GROW HQ will within the next 5 years attract 250,000 visitors, re-skill 17,000 people to learn how to grow and cook their own food. The GROW HQ bistro is rated as one of Ireland’s Top 100 Restaurants by The Sunday Times. It also won the Plot to Plate award at the Food & Wine Awards in 2017.